This photograph shows the stunning stand which was made to be placed underneath the Franco-Flemish harpsichord. The escutcheons at the summit of the legs are ribbed and framed with elegant foliate decoration. The cabriole legs have elaborate goat feet (cabriole means 'to leap like a goat'). There are the usual scrollwork, scallops, foliate and flower decorations carved and moulded into the gesso, all of which are typical of the high French roccoco. The height of the stand is greater than normal and raises the instrument into a slightly higher playing position than is usual. This may have been done to accommodate the luxurious ladies gowns and petticoats of Mme de Pompadour, so that she could be seated normally while playing the instrument. Visually the raised position makes the instrument look particularly striking and imposing. 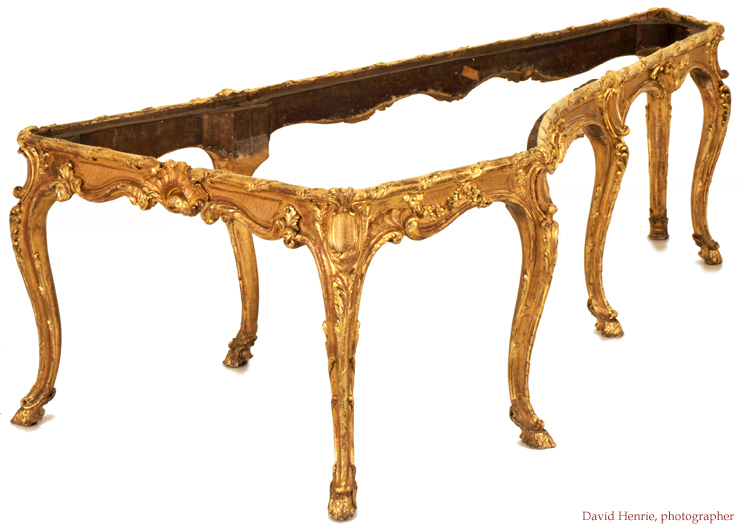 The stand is very fine and beautifully carved and gilded. However, this style of furniture would have been completely out of date in 1786 when the Empire style was all the fashion. But unlike the case of the instrument it has not been widened on the cheek side, and must therefore date to the compass extension of 1786 by Barberini and Hoffmann. Clearly the stand was made specifically to co-ordinate with the Rococo style of the rest of the instrument's decoration.